“The word sea-change is from Shakespeare, from The Tempest: a man is thrown into the sea, and under the water he is transformed from what he was into something entirely new, something '“rich and strange”. This is the story of my sea-change - the journey from one way of living to another. It’s also an invitation to a sea-change of your own. No matter your age, your gender, your season of life, no matter your politics or profession, your sexuality or your faith tradition, you are invited into a sea-change. Years ago, a wise friend told me that no one ever changes until the pain level gets high enough. That seems entirely true. The inciting incident for life change is almost always heartbreak - something becomes broken beyond repair, too heavy to carry; in the words of the recovery movement, unmanageable. I’m back from holidays. It’s been an interesting few weeks. The time for self-care was much needed. In fact, it was needed more than I care to admit. I mostly slept and did little at all for the first four days. I hadn’t realised the level of my exhaustion. That’s the thing about holidays. It’s a chance to remove yourself entirely from all the busyness and the noise (that has become mostly the norm) in order to hear yourself think and to listen to your body and what your heart is telling you. So anyway, I had the most wonderful, unplugged, restful and restorative time. And I spent no time thinking of business or busyness. I put that all down and just immersed myself in the present. And Brooms Head is the perfect place for that. It’s a yet unspoiled, non-commercialised, hidden jewel among beach holiday destinations (I hope it stays that way). It’s the perfect place to reconnect with who you are and the natural world. And I intend to continue the yearly tradition so that I may reflect on what’s important and to recalibrate my life. Me standing looking out to the sea as the sun starts to go down. Photo taken by my daughter, Philomena, who now has the photography bug. When you remove all the noise and really listen, it’s like you’re listening for the first time. You go to sleep with the soothing sounds of waves gently crashing onto the shore, or the gentle rain (sometimes it was pelting rain). Some nights I fell asleep to friends and children talking and laughing as they continued into the night, catching up on each others lives…slow, deliberate conversation and general banter; competitive voices as board games were being played, shared meals, and lingering around the communal table with drinks and nibblies, with yet more laughter and conversation. 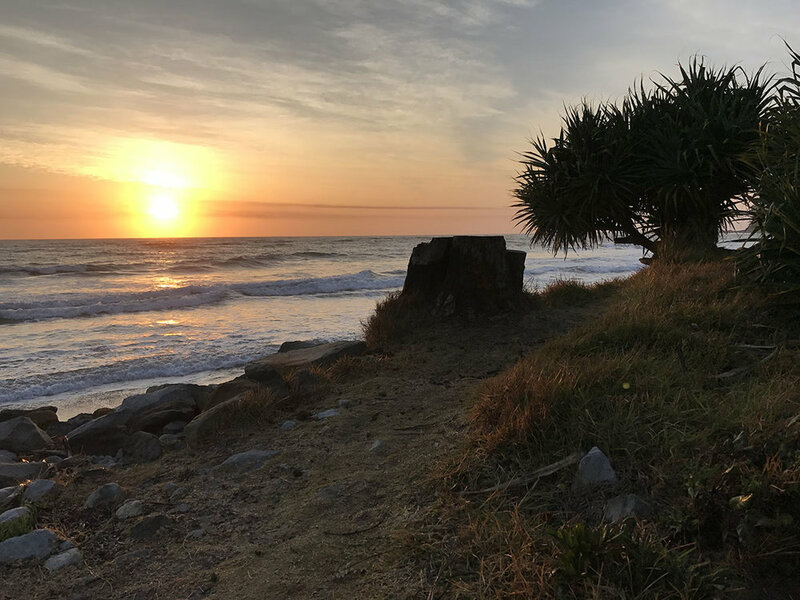 Each morning I woke up, made myself a cuppa, took my camp chair and sat on the edge of the bank, watching the sun still rising over the ocean and listening to the waves and the birds, and the sounds of people in the camp site, slowly waking to the new day. 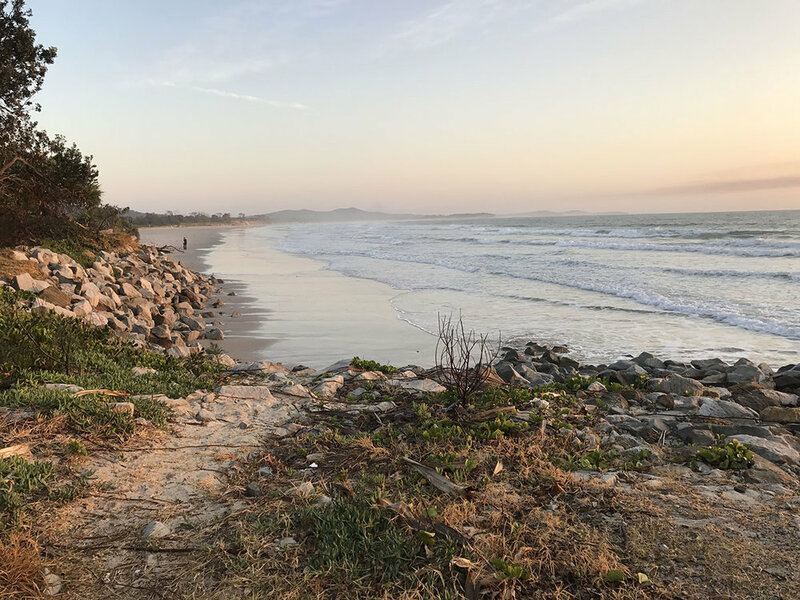 Days were filled with beach exploration, short walks, photographing native plants, wildflowers, wildlife and the odd sunset or sunrise, lazy lunches and more stopping for chats and conversations, and time for reflection and contemplation. It was a chance to empty myself of the busyness and pressure of a life filled with pushing, expectations, deadlines and striving. A chance to be me, to listen, to observe, connect and to feel joy, wonder and contentment in each moment. A chance to truly tune in to the important things. Man fishing in the beach inlet leading to Cakora Lagoon, with the sun setting behind dark clouds above Clarence Valley. During my much needed rest, I gained immense clarity about where my life is. This has led to some life-changing decisions. Turning fifty next year has also had me contemplating what I want to do and who I want to be for the next half of my life. All I know is that in the second half of my life, there is only time for the important things that bring me joy. These decisions have been truly considered, as so many things over the past three to four years have led me to this point. I hadn’t realised how much busyness and disconnection have crept into my life (all self-induced) until only recently. One major tipping point has been my health and fitness. For those who have known me longer than three or more years, they will know how integral that my health, fitness and vitality is to who I am. And it’s suffering to the point that I can no longer ignore the warning signs. Along with my health, my family have suffered in the process of me striving. So I will be stepping back from my business forthwith to rest and recover. I will be seeing out the remainder of the year completing my client projects and commitments, and wrapping up what I need so that I can focus on my health and my family. As for my future and that of my business, I’m not making any further decisions about that until I’ve sufficiently recovered. I just need to rest and to give myself the time to regain my health. If you need to access my blogs and posts and information on video training, everything will still be here. Thank you all for your support and I want to encourage you to pursue whatever it is you feel is important to you. All of our journeys are so different. One is no more important than anothers’ - it’s just different. And it’s your life to live however you choose. With only a few months until Christmas, are you feeling a little anxious about getting everything done in your business before the end of the year? If so, then you are not alone. This is often the time we take stock of how far we've come in the year, and how much we still need to do in order to tick everything off on our yearly to do list. I myself have started to do this, but with a few projects on the go and home and family life being a little crazy, I haven't had a chance to do it. In fact I'm feeling a bit tired juggling all the balls. And with the juggling I must admit I've dropped a few, and haven't kept up to speed with my weekly posts recently. It's also come to that time of year when we go away for school holidays at one of the most beautiful and unspoiled places not too far away...Brooms Head in Northern NSW. There is a big group of us, adults and kids and we have a wonderful, unplugged time just being in the moment, swimming, walking, talking, creating, laughing and eating. There's nothing like coming together in the spirit of community, and at the same time allowing ourselves some space, and the gift to switch off from the outside world, switch off the time clock and be fully present to each other and nature. So I thought I'd just let you know I haven't forgotten you. I'll be back on board after the school holidays with regular posts and information. I'm off for much needed rest and restoration for my heart and soul (and sanity) in the spirit of self-care. And upon my return I start a new health and wellness program so that I can feel like my old self again. How about you? Are you in need of self-care? If so, I encourage you to take time out from your busy schedules and make time for yourself. The world will still go again and it will be there when you get back. One of the best ways to build your community, build credibility and provide great value to both new and existing customers is to teach them to learn a skill, complete a process or a task that they want to know about or solve a problem, or to educate and inspire them. How-To and Educational Videos are a great way to do this and there are many different ways to create video to get across the information you want to impart. In fact, there are so many different types of these videos, it's easy to get into overwhelm about exactly where to start and what type of video to choose. If you've read my articles before, you'll know that I always recommend to start simply and where you are at, if you are creating your own videos. And what I mean by that is, consider what gear you have, because that will determine to a great degree how to approach the video capture and production side of things. Things like if you are using a phone or DSLR camera. How many do you have to video...one or two or more? Do you have a microphone or a tripod, and do you have enough lighting? If you're not sure, you can read this post. Before you begin to create your video, sit down and write down a list of questions that your customers come to you with, around solving a problem or an issue. Are there any things in particular that you get asked a lot about? This will become your ideas list for your 'How-to' or Educational videos. Let's just quickly make a distinction between 'How-to' and 'Educational' videos. In a nutshell, 'How-to Videos' are about using a 'step-by-step' approach. Whereas educational videos are more about 'informing', rather than 'instructing'. Depending on how your deliver the information will determine whether it is one or the other. However, the terms are interchangeable and in fact they often overlap in terms of format. In the overall scheme of things, it's not important about the distinction when creating your video. It's more important that you deliver the content in a way that people understand it. So say for instance you're an IT company, and you get asked a lot, "How do I set up automatic back-up of my systems?". Write that down on your list, along with all the common questions you get asked. Once you've written down the list, choose one topic, then work out what is the best way to get the information across to your customers for that topic. If your business, question or problem revolves around making, constructing or putting together things and is highly demonstrable using your hands, you're best to physically show people how-to do it. It's not something that you're just going to be able to talk about for them to fully grasp and apply what you are teaching. Example of a ‘How-to’ video showing viewers the physical steps of how to sew a patch pocket. If your business, question or problem revolves around technical processes, concepts or ideas, then there will be less of a physical or hands-on approach. Your video will need to either explain by just talking your way through it, and/or introducing other visuals and/or digital screen capture, in order for your viewer to be able to fully grasp the process, concept or idea. Example of a ‘How-to’ video using screen capture/recording. The following are a couple of examples of videos which are more Educational style videos, rather than How-to videos, but you can also see in the first video how it is overlapping. Example of an Educational Video which would also be considered a ‘How-To’ video, using a combination of talking head delivery and simple graphics. TED Talk videos are a form of educational videos. This type of content is great if you have topics based around intangibles. Once you've worked out which approach you are going to take and the question, task, problem you are going to tackle, then write out the process or the instructions in a logical sequence. Go through each step of the process or each instruction and what you're going to need to take them from start to finish. where will I set-up (if it's a physical location)? what screen recording software will I need (if you have to take the viewer through a step-by-step process shown on a screen)? how will I record my voice? Can I get away with just recording an audio file or do I need both audio and video? And do I need a microphone or can I just record straight from my computer? what visuals will I need in order to support what I am saying to help the viewer understand? Work out your shot list of the types of things you want to show that match what you are saying - they can be video footage or photos. You'll find that as you take yourself through this process in a logical sequence, questions will arise along with ideas and pictures will come to mind, so write all this down. It's then time to sit down and work on a script. The 'how-to' or educational part will make up the body of your video, but remember that ideally you will include an introduction and a conclusion. To find out about a basic structure for a script, see this post. **HINT: If you're having trouble working out what form of how-to or educational video to create, look at the videos of other businesses in your industry for ideas. 1. Write a list of your most commonly asked questions, tasks, problems, etc that your customers ask you about. 2. Choose one to create a 'How-to' or educational video. 3. What approach will you take? Hands-on, Talking (called Talking Head video), Screen Capture or combination. 4. Write down the each step of the process. 5. Write down what you need next to each step. If you get stuck, confused or just need a hand as you're going through this process, then shoot me an email so I can help. Next week I want to take you through other considerations when planning and putting a video together. It will depend on the level of professionalism that you're aiming for and the complexity, around what and how many production elements you want to include. This includes both the production side of things, i.e. filming it and also the post-production side of things, i.e. editing and motion graphics, etc. Do you have information and skills that you would like to impart to your viewers? It could be information about your products, or how to use them. You may want to take your viewers through a step-by-step process for learning a skill or putting together a piece of furniture, or taking them through how to use a piece of software. Or maybe you need to train staff or take paying members through a number of modules to complete a course. Whatever it is, educational or instructional and how-to videos are a great way to impart knowledge and get across the information in a faster, clearer and more succinct way than giving written instructions. By 'showing' your viewers what to do it helps to cut down on confusion, takes less time and will result in a higher percentage of success and completion for the viewer. Which means you have a satisfied customer and user because they've achieved the results they are looking for. Educational and instructional videos can go from something really simple to very complex when it comes the visual and motion graphics side of things. So you need to determine whether you are creating videos for yourself and what equipment you have access to, and/or whether you have the budget to pay someone else to create them for you. I would also recommend, that if you're starting out, start with something simple and work your way up as you get better at it and get a better understanding of what you want and what's going to work the best for your situation. Whichever option you choose, be sure to work out a video strategy around what videos you want to create, how many and the information you are wanting to impart. If you can create videos as a series or a 'batch', it will also save you time and money in the long run. So say for instance you want to create a series of videos highlighting specific services or products. Try to create these videos all at once over a day or part of a day (if possible). Have a plan well ahead of time, and work out the objective of each video; what you're going to say, and what type of imagery, text and/or graphics you want to use to best impart the information you want your viewer to absorb. Also, you need to understand 'where' your videos will be seen and for what purpose. Apart from the objective of your videos and what information you want to relay, you need to understand how and where your video will be viewed and consumed. As an example, I created a series of educational videos for my client, Artemis, who wanted them specifically for an upcoming festival. As an exhibitor, she wanted to use videos to catch people's attention so that they would then want to find out more information about essential oils. She also wanted to be able to use these videos later, for her paying members on her website. - The date of the festival (so we knew what our timeframe was to create the videos). - What essential oils, recipes and instructions she wanted to show, e.g. meditations, surface spray, breath freshener, facial cleanser, etc. - The location and setting that would appeal to her target audience (spiritual setting with nature background and that was tranquil). - The length of time of each video, which depended upon the subject of each video. Some were longer than others. - What imagery we needed to use to get her points across, as well as help them to connect with her. - Write a script for each video, which included an introduction, body and a conclusion based on where and how the video was going to be consumed. Now because there was limited time to create around thirteen videos, we had to keep the production very simple as they all had to be shot in one day. Also, my client needed to have downpat her scripts for each video. No easy feat for anyone. Luckily she is very experienced in public speaking and was extremely knowledgable about what she was talking about. c) the videos where going to be used for her member-only section, so she didn't need to tell viewers where to find her products or services, because they would already be using the products (we also created two sets of videos, with one set to include call-to-actions to be used at a future date). So if educational and instructional videos are something that you've been considering for a while, then I would encourage you to sit down and work out a strategy around what you would like to teach or show your customers or audience, how many videos you would like to create and the order. Next, get to work brainstorming how those videos will be best structured to suit the content and get across the points you want to make. And then think about where your videos will be seen or consumed.Also think about where your customer is along the customer journey, i.e. are you wanting to attract new leads or are you speaking to customers that already know, like and trust you? Next week we'll starting looking at different types of educational videos and talk about ideas around programs, structure and how and what you can include in your videos to get across the information you are wanting to get across to your audience. And of course, we'll start with simple ideas that you can utilise whether you are creating videos on your phone or DSLR camera. If you have any questions, shoot me an email and I'll be happy to help you out. And if you're not sure where to start, if you haven't already, check out my series of articles, '4 Steps to Easy Video Creation' where you'll also get access to a Bonus Worksheet. "Making stuff is great. Making connections is even better." Thought about creating video, but maybe you think you need all the gear before you start? Well today, I'm going to make it even simpler for you and tell you that you don't even need your phone. Yep...that's right. In fact, if you only have a laptop or desktop, you can still create videos. And easily shareable videos to build relationships with potential, new and existing customers, as well as staff. By using video and screen recording software that records directly from your inbuilt laptop or webcam for your desktop computer. So I stumbled upon this great FREE program called LOOM. It's fantastic for connecting with potential, new or existing clients because it adds a really personal touch and it's simple and takes minutes to create. What can you do with LOOM? -- Send personalised, snackable videos to your customers, rather than a long, drawn out email. -- Do a product walk-through or demo. -- Create an Instructional or Training Video using easy-to-follow, screen-recorded, step-by-step instructions and record yourself talking a the same time. To find out more about how you can use Loom to convert sales and build engagement, check out these Case Studies. - attach videos directly to your emails using GMail, so that the person you send your videos too, can open them directly in the email. Here's a really quick video I created in Loom for my business networking group as part of a 5 min presentation that I gave on using video in email marketing as part of your video and marketing strategy. I just wanted to show what the Loom screen looks like when using both the camera and screen capture option, and explain how easy it was. I embedded the link in my powerpoint presentation to play the video. So this is another way you can use the software - create videos to use in presentations. *N.B. For this video, because I literally only had two minutues to create this video, I didn't have time to go in and shut off some of the display buttons before recording.You just make sure you do this and set that up before recording. In fact, only yesterday I got some great feedback from Karen, owner of Outfox Marketing, who after seeing my presentation, decided to try Loom with great results. So Karen shared with me that she created a number of training videos for her client, whom she is training in Google Adwords. She was so happy with the results and was surprised how simple and easy it was for her to create these training videos to deliver great value to her client. So I hope this post stimulates some more ideas around how easy it is to create videos. And for this one, you don't even need to use any specialist video equipment. And remember to let me know how you're going, and if you have a win, please share. This week I wanted to take a moment to say THANK YOU! Thank you to all of you who open my emails, read my articles and posts, leave a comment, ask questions, provide feedback, like and share the content I provide, (or just stalk me ). Thank you to those of you who are giving this video thing a good hot go. ...move forward with imperfect action, and move through the fear anyway. The last few weeks I've been getting comments, questions and feedback about peoples' individual video marketing journeys in their businesses. Some have had breakthroughs and wins, and others have had challenges and reached out to resolve them. And each one of them has been at different stages of their journey, doing different things. Of course, what has given me the greatest joy, are the people who have said that they gave something a go. And they were excited and over the moon because they took that step and have been positively buoyed by their own actions. They were excited because they pushed through the fear or uncertainty and then found that it wasn't really as bad as what they thought. But now they've done it, they feel inspired and motivated to do it again! So this week I'm going to share with you some feedback and a video from Andy, who had read last week's post, 'How to Add Captions to Your Video'. What I found inspiring was that Andy not only read the post but then applied the learning on the same day, where he was hiking, climbing and biking up Grand Pic du Galibier in the French Alps. This is the comment he left on my Linkedin page. And here's a screenshot of his post, comment and video with captions. Click on the link to watch his video (for those of you who are on Linkedin). How excited was I to get a tag and comment from Andy about his jubilation and success. It made my week! So please keep those comments, feedbacks and questions coming. If you have any challenges or are just getting stuck...reach out. And most of all, please keep sharing your wins, however small. I want to help you celebrate them. This month we've been talking about Video Strategy, and if you've missed my post on this you can find it here. So this week I'm going to talk about a topic that is becoming more and more popular...CAPTIONS. Should you include them in your videos? Read on to find out. Also, thanks to Nathan from Your Local Termite and Pest Control for his email asking a question about an easier way to create captions in Kinemaster (phone editing app), that doesn't require manually having to enter it in. The long and short of the answer is...No there isn't. And I have a sneaky suspicion that Nikki's video from last week's post, created questions around captions, as she used them in her video. We're seeing the use of captions in video more and more now. In an article dated May 2017, it states that 85% of video is watched without sound. A whole year on, that statistic may have increased significantly. Like any statistics though, you still need to weigh this up and look at your particular video strategy to determine whether using captions in your videos is critical or just a nice-to-have. But I must admit, I now watch videos (mainly in FB) without sound first. Then if I think it's something I'd really like, I'll replay it with sound. What are your thoughts on captions in video? Screen shot from video I added captions to, using Kapwing. So, how do you add captions to your videos? But before we get to that. If you go to my previous post 'Shooting, Editing & Uploading Your Videos', I've listed the best and most cost-effective editing apps, both for your smartphone or PC. Understand that if you use phone apps, they are going to be clunky and they require a lot more work and fiddling around. It's cheaper, but it's also time consuming. There is always a trade-off. If you're wanting to up the quality and complexity of your videos, and you intend to create regular, consistent videos, then to save you time, for a small investment, you're better off investing in a PC editing software like Camtasia or Cyberlink PowerDirector. So even if you create videos on your phone, you can upload those into your PC software and edit and upload from your PC. (Phone only) When editing in Kinemaster You have to manually add text as you listen to the video. You also have the ability to add a background to the text (See this video for instructions on how to add text/captions. Warning: it's in a foreign language, so just mute it). Keep in mind that's it a pain, takes longer and it's clunky. (Phone or PC) If you're using phone, there is another app that you can download that has the option to add captions. It's called Kapwing. You can also download this app to your PC, and I recommend that it's better to do it via your PC as it's too hard in the phone app. Also, there is a cost to remove their watermark at the bottom (like all free apps). You can pay a one-off fee of $6 USD or a monthly fee. Upload an SRT file (Subtitle file), which is the most common type of 'Transcript File'. Upload a transcript file, i.e. SRT file. Use YouTube's automatic captioning service (not recommended due to less-than-optimal translation). See this link to a very easy to understand video on how to do add captions in YouTube. You can switch on the option to add captions automatically. Understand that the translation won't be perfect. a) SRT File. You need to upload your video first. When facebook tells you it's been uplaoded, then go back to the video and click OPTIONS in the bottom right hand corner then choose 'edit this video' where you will see where to upload your SRT file. b) Upload a video you've already added captions too. Upload your video file to your Linkedin post. Once the file is uploaded, click on the pencil icon (edit) in the top right of the video and select your SRT file and save. Upload a video you've already added captions too. So how do you create an SRT file? Okay, there are a number of ways. The first way is to manually transcribe your video as a *.txt file. This is way too hard and time consuming. But if you'd like to know then you'll have to google it. My Recommendation: I like the fastest and easiest option. Choosing the difficult path results in you stalling and never getting to the next step. The easiest way that saves time is to have the captions converted from your video into an SRT file. So the best online service that can do this automatically for you is REV.COM captions editor. It costs $1 (USD) per minute (super cheap). Step 1: So you place an order and select 'captions'. You upload your video file, and choose to convert to SRT file. What it will do is then read the video and create an SRT file format (.srt). So if you use Camtasia or Cyberlink Power Director, you can import the SRT file directly into the software and it will automatically create the captions for you. The beauty about this is that the file has all the timestamps included in it. If you had to do it manually, it would take forever because you have to write in the timestamps. As a test, I uploaded a 1 min video file (extract of a testimonial video) that I used for instagram to REV.COM. It took 6 mins for them to create an SRT file and cost $1.15 AUD or thereabouts for the file. Also, you can edit the text in the file before downloading the completed SRT file. Because sometimes they don't always pick up the correct spelling of things like names. So you can correct it, then download the file with the corrections. But it's very accurate. As an experiment, I then uploaded the original video file to a free program called HD Video Converter, and uploaded the SRT file to add captions to the video. The point is, once you have an SRT file, you can upload that to multiple platforms to create captions on your videos. Let me know if this helps, and if you have any questions. Thanks again to Nathan for this great question! I hope last week's post about how electrician Chris Moore, uses powerful stories to inspire his customers to action, helped you to see what stories are all around you that you can share in your business. This week I wanted to share with you another real life example of how you can use story...but this time in your videos. So I want to quickly introduce you to Nikki Ingram of Change Frame. Nikki is a small business owner and helps people who want to create or cope better with change in their life. She is also a past participant of my DIY Video Workshop that I held last year in November. So I'm very excited and happy that Nikki has taken what she's learned, gone away and worked out a strategy as part of launching her business this year, and is now creating and using videos in her business. Recently she's been creating story-based video using CASE STUDIES. Case Studies are just one way, and indeed a powerful way of using story to connect with your target audience and customers. The reason being is that case studies are based on real people (your customers) who have used your product and services and have received a happy, if not excellent outcome. As consumers, before we buy anything, we like to know that others not only have used our products and services, but that they have got the outcome they wanted. In this video that Nikki has posted to her Facebook business page, she shares a story about her client Mary. Mary is re-entering the workforce after an extended period off and is looking at the next steps to get back into the workforce. Nikki gives us her name and business name (you could also add in a little about what you do or what your business is about that's unique). Then Nikki let's us know what the video is about. She then gives us an overview of Mary's story, starting with why she went to Nikki for help, how she took Mary through the Change Frame Process and the outcome. 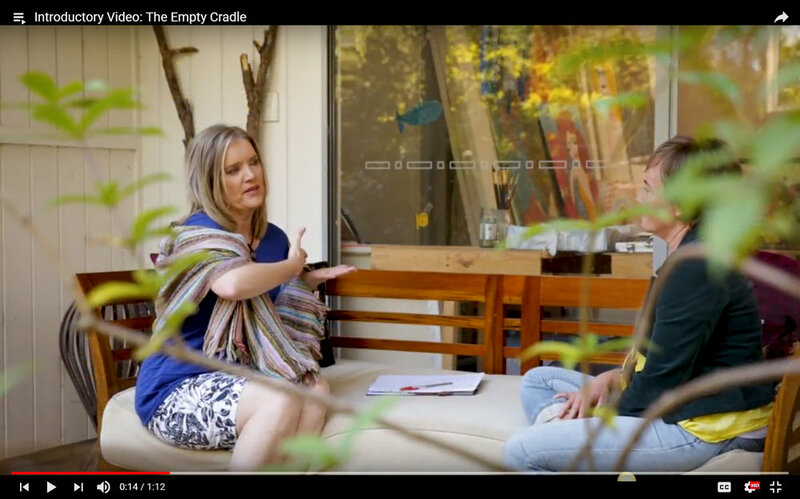 Nikki then finishes off with who she is and her business name, but most importantly, she tells her viewers what they can do and how to take action to get the same results using the Change Frame Process using a CALL-TO-ACTION. Handy Tip: When giving your audience a call-to-action, stick to ONE CALL-TO-ACTION so your audience doesn't get confused and it helps them take decisive action. Lastly, Nikki has also used captions in her video. This is becoming more important for short videos as more people are watching videos without sound. "Nikki your video is really informative. I initially wrote it is a great resource for younger women, but after checking out your website I’ve edited my comment because I think it is a great resource for anyone contemplating or facing change." So I hope that this has helped you with ideas around using story in your videos. Case Studies and Testimonial Videos are an easy type of video to create and are one of the most powerful ways you can connect with your audience because they are based on the real life stories of real people. If you would like help with getting started with video and are serious about using video in your business, then book a Video Strategy Session with me today and we'll come up with ideas, strategies, tools and an actionable plan to get you started. Until next week, have a great week and go out there are start playing and having fun with video! "The world is shaped by two things - stories told and the memories they leave behind." You may or may not have heard a news story about a young girl in WA (Western Australia) who received an electric shock at her family home back in April this year. Denishar Woods, aged 11 years old, received a massive electric shock which nearly killed her. She was left brain damaged after 240 volts of electricity coursed through her body. Because I don't listen to news regularly, I hadn't heard about this tragic story. But I did find out through a business colleague, Chris Moore. Chris is an electrician and owner of PBP Electrical, and is part of my business network called Key Business Network (KBN). You see, Chris gave us a short presentation on electrical safety. Actually, he's given quite a few presentations on electrical safety. Now you might think that electrical safety would be a dry, boring topic (sorry Chris), and normally I would agree. But when Chris talks about safety, it is not only interesting but highly impactful. It's impactful because not only is he passionate about electrical safety, but every time that Chris talks about it, he leads with a story. And not just any story. He uses powerful stories that relate to a specific area of expertise that he specialises in. Chris also presents and talks in laymans terms, in a way we can easily relate. And he paints a clear picture for us. In this particular presentation where he talked about the story of young Denishar Woods, he looked at the possible causes of the tragedy by drawing attention to our own homes and showing a diagram of how electricity loops from our powerlines into our homes in a circuit and is carried back to the lines. He then showed how the tragedy may have occurred (it's an ongoing investigation) and the possibility of the same thing happening in our own homes. I always learn so much after one of his talks. I even remember the diagram and how it all works! Chris also explained what signs to look out for and what action we need to be taking to ensure that this tragedy does not happen to us or our loved ones. As I listened to Chris talking about 11 year old Denishar, I immediately thought of my 12 year daughter and how I would feel if the same thing happened to her. I couldn't even begin to imagine what it would be like if anything like that happened to her. But the gut-wrenching feeling was visceral and instant. It brought on a sense of urgency about making sure that our electrical system was in order and safe. Now luckily, I've already had Chris do a safety check on our home, so after the intial response, I felt relieved knowing that our electrical system was fine. The thing is, I think everybody in our group has had Chris do electrical safety checks as well as other related jobs, in their personal homes and/or businesses. And I'm pretty sure it's usually been after Chris has given one of his presentations. Because I wanted to give you an example of the power of story and how it can move others to action. And it doesn't have to be in a big, flashy way. Some of the most connecting stories are seemingly ordinary or about subjects that most of us would consider dry and analytical. And Chris doesn't just use news stories, but often shares stories of his own customers' and their experiences in order to raise awareness of how important it is to ensure that your home is safe. So what stories are happening out there that relate to your business and what you offer and that show how you can help your customers and audience? Whether they are stories from mainstream news, your stories or your customers' stories, or the stories of other people that you stumble upon through your business or personal life that carry a message. It doesn't matter. But now that you have the awareness that stories are all around us, next time you hear of a story that you think has relevance and can be used to highlight your products or services, then write it down. And then sit down and think of how you could incorporate those stories into your videos and how they can emotionally connect with your customers. Have fun with it and have a great week! * P.S. If you're stuck on how to use story in your business in videos, feel free to book a Free Discovery Session, where we can delve into your business a little and brainstorm some ideas. In last week's post, I talked about how you can add interest to your videos, once you're ready to move on from 'talking head' videos. What I didn't mention, is that by mixing various elements into your videos, not only are you adding interest to your videos, but you're inevitably telling a story. Anyone has the ability to tell a story. In fact, we all do it without realising. Our lives are made up of continually evolving stories. Whether we are at home or whether we are at work in our businesses doesn't matter. But it's in the way that we tell them, which makes people sit up and take notice. Last week I gave you a practice activity to try. I know some of you aren't ready yet for that or may not have had time yet to tackle it, and that's okay. I like to get you thinking and give you inspiration moving forward. And for those of you who did...congratulations! You have already won because you've started. This week I'm going to give you another example of how to use visuals in a specific way to tell a story so your viewers hang around longer to watch your video. It's simple and I recommend using three types of shots we discussed last week: Wide, Medium and Close shots. I'm using another video I created for a small business as an example, so you can understand how to use these three types of shots to tell a story about your business. Below is a brand story video I created for small business, Home Amongst the Green, where I use all three types of shots to tell a story. Here are screenshots of those three types of shots from that video. Wide Shots are used primarily at the start of a 'Sequence' of shots. It is often called the establishing shot, because it establishes a location or scene in which something takes place. It encompasses a larger area so that you as the viewer can quickly sum up where and what is happening quickly, and provides context. A close shot is when you zoom in really close to focus on one single aspect of the wide or medium shot. The reason to use a close shot is to emphasise something of significance. Whether it's an expression on someone's face to heighten and connect emotionally, or whether it's to focus on an object or group of objects to support or emphasise a point. By sequencing your shots, that is, taking the viewer from wide to medium to close, it will have more impact on your viewer and tell a better story. The thing is, you only need the viewer to see each shot for a number of seconds to communicate what you want them to understand. It takes less time than what it may take to actually explain it in dialogue. And don't be afraid to mix up the shots and try sequencing them differently to tell a different story and emphasise a different point. And once you understand how to use this principle, you don't even have to stick to three shots. Sequencing shots also keeps your viewer interested because they are having to think and creates distraction for the viewer (in a good way). So this week, why not try out these three shots. You can take them as photos or videos. Then put them in order or sequence from wide to medium to close. Play them back and see if the three shots are telling a story. And try this a few times. Vary the shots a little. Maybe move things around the room or place things differently and take the shots again. If you create any videos using video footage or photos using the above sequence and want some feedback to see whether you understand or are on the right track, feel free to email me at info@truth-seeker-images.com, and I'd be happy to cast an eye over it. In fact, if you're already creating video and would like me to have a look and make any recommendations, I'd be happy to help. "It's always the simple that produces the marvellous." Today we're going to cover the last step of '4 STEPS TO EASY VIDEO CREATION'. If you've missed the previous steps, you can find them here>>> STEP 1: CREATE A VIDEO STRATEGY; STEP 2: START WITH 3 SIMPLE TOOLS; STEP 3: WRITE A SCRIPT. So by now you should have a pretty good idea about what type of video you want to create, what your objective is for that video and what you want to say. You should also know who your ideal customer is and how to speak to them as though you are talking to them directly. Now it's time to apply what you've learned and put it all into ACTION! Don't worry about getting it perfect. This is your first step to practicing and honing your skills and your message. It will take you a number of goes to get it right and learn what works and what doesn't. You will learn as you go. But if you don't start, you will never get going and you'll get left behind. So now you've written your script, you've practiced it and you feel natural in your delivery, and you're ready to hit the RECORD button on your phone. **CHECK*** Here are some refreshers to double-check your EQUIPMENT, LIGHTING, and BACKGROUND. I always recommend to start simply when it comes to business video. Talk about one subject, stand or sit in one fixed position and record one continuous video using your script from start to finish. Take your time and pause when you need to. It's best that you set up your phone on a tripod so it's nice and steady and make sure your camera is at least eye level or slight above, angling down (this is the most flattering angle to make you look your best). Depending on what type of video you want to create, depends on how complex your editing needs to be. When beginning, just start simply. The best place to start is with no editing and simply record your video live or pre-record it and upload to your platform. When you feel comfortable with this, then you can start getting more creative and add things like your name, text, captions, your logo, photos, music, multiple videos and more. ***Are you using Facebook Live? *** If you are, you can activate or add captions to your live videos. But be aware that it's not always 100% accurate. For those of you who want to do everything on your phone, I recommend using the Phone Editing App called Kinemaster (available for both Android and iPhone users). Start with the FREE version to see if you like it, and then if you want to be able to do more things, then you can subscribe to pay monthly (approx. $5 AUD per month). But try other video editing apps and see if you like them first before upgrading to a paid version. Whatever app you are using, be sure that it can do what you want it to do, i.e. add text, subtitles, music, voice-overs, multiple videos, etc. Of course, depending on where your videos may be seen, you may only need to record a video and then upload it directly to your platform or software. Especially if you are creating videos for online courses or programs, or using them in your emails. Or you mainly use livecast platforms, such as webinars or webcam. Again, it all depends on your video strategy and what you need to include in your videos. Once you've created your video, you've edited it (if applicable) and you're happy with it, it's then time to upload your video. Depending on where your completed video is sitting, will depend on how you upload your video. Is it on your phone and sitting in your editing app? Have you saved the video to your phone gallery or are you uploading directly from Camtasia or other software? ***REMEMBER*** make sure that your video is the right size and format for where your video will be seen. To check, go to the platform you want to upload to and check to see what your video format and setting needs to be, i.e. 720p or 1080p for FB, YouTube, Vimeo, etc. Thanks for sticking with it through all the four steps. To help make the process a little easier, and as a THANK YOU, I've created a FREE CHECKLIST for you called '4 STEPS TO EASY VIDEO CREATION'. You can download it here or click on the image below. Now that's not the end. It's just the beginning! To get better at video creation takes practice, so now it's up to you to go back to the start and go through your steps again and RINSE and REPEAT. And before you know it, you'll be so comfortable creating videos you may want to start getting a bit more creative and you'll be putting out more and more videos on a regular basis and growing your business and getting more customers! Of course, if you have any questions, comments or feedback, please hit REPLY and I'll be happy to help! And if you'd like some One-on-One Video Coaching, click here for more information. "To make great film you need three things: the script, the script, and the script." Today we're going to cover Step 3 of '4 STEPS TO EASY VIDEO CREATION'. If you've missed the previous steps, you can find them here>>> STEP 1: CREATE A VIDEO STRATEGY;STEP 2: START WITH 3 SIMPLE TOOLS. STEP3: WRITE A SCRIPT, is not so much about WHAT you're going to say in your video, but more importantly, HOW you're going to structure what you say, to get the attention of your audience and maintain it. And we're going to start with the simplest structure which has three parts. Though I've added an extra part to cater specifically for videos. We're also going to stick with a script more suited to businesses, rather individuals. Remember though, the basic structure doesn't really change much whether it's a personal or business video. It's the content that makes your videos unique and how you visually piece them together (but we'll go more into that a little later in the year). Again, we're using a common structure for business videos. So you should introduce yourself, your business and what topic or topics you are going to cover in your video. It's important to say your business name (and your location if your target market are in a specific geographical area), so your audience knows who you are and they don't miss what you say because they are waiting for a name. Next, give a summary about what you're going to be talking about so your audience can decide whether they're going to hang around to find out more. HANDY TIP: Please note that for SEO (search engine optimisation) purposes what you say is important, especially for YouTube videos which don't just read the tags you enter in the back end of your video, but also read what you say as keywords for search engine ranking. Sample Script: "Hi, I'm Kerry Warnholtz from TSI Multimedia and today I'm going to show you how to write a script, by putting your words into a simple structure that will get and keep the attention of your customers." The body makes up the largest part of your video and is what your video is about. Your topic/s should speak to your customer. That is, the words you use needs to resonate strongly with them, as though you are talking directly to them. And what you say should address their specific needs, wants and/or pain points. Try not to cover too many points or topics within your video, as you'll confuse your audience, they'll get bored, or just switch off. Lastly, you then need to offer them a solution and explain how you can (uniquely) help them to solve their problem. Here you should revise and summarise your main points of what you covered in the body of your video. At this point it's also recommended that you sign off saying again, your name and business name as you did in the introduction. This will then lead or meld into the Call-to-Action as below. Your CTA is all about what action you want your audience to take. Do you want them to sign up for a blog or newsletter; buy a product or service; sign up for a course, ebook or program? Or maybe you don't want them to buy anything, but your call-to-action is part of an engagement strategy or series of topics that give value and build your network, database or community. Or it could be just to educate or build your audience's awareness around a sensitive topic and the outcome you want is for them to come to a specific conclusion. Whatever action it is that you want your audience to take, ensure that you only give them ONE OPTION for one video. If you give too many options, your potential customers may get confused. And when they are confused they do nothing. CTA example: "For this week only, we're giving away a FREE 500g Bag of Origin Coffee beans when you buy an Expresso Machine. Be sure to enter in this promo code ---- when buying." So this week, why not try putting together a short script following this structure to introduce yourself and your business, and what you want to talk about, finishing with a clear call-to-action. Read it out and time yourself as to how long it takes to read the script. You can then use this script to create a short welcome or introductory video to sit on your website or facebook page. Be sure to keep the video to two-to-three minutes at the most. I hope this helps. In the coming weeks, we'll look at how you can make the content of your videos a little more interesting by changing up the script a little and adding in other elements. Next week however, we're going to cover the 4th and last step of '4 STEPS TO EASY VIDEO CREATION', Step 4: Shooting, Editing & Uploading Your Videos - Action Steps, and how we bring all the previous steps together to create a finished video. ***FREE 90 MIN WEBINAR: 'PLAN, CREATE & EDIT YOUR VIDEOS ON YOUR PHONE' TUES 12/6/18 @ 10am***Do you want to use video to start growing your business? Maybe you don't know where to start, or understand all the tech stuff. Or maybe you're just overwhelmed with it all? Next Tuesday, I'll be holding a FREE WEBINAR to take you step-by-step through the process of planning, making and editing videos on your phone, so you can start getting some traction in your video marketing. So join us and REGISTER for my webinar here >>> http://bit.ly/plan-create-edit-video. If you can't make it live, don't worry--as long as you register, you'll have access to the recording. "Never overlook the power of simplicity." 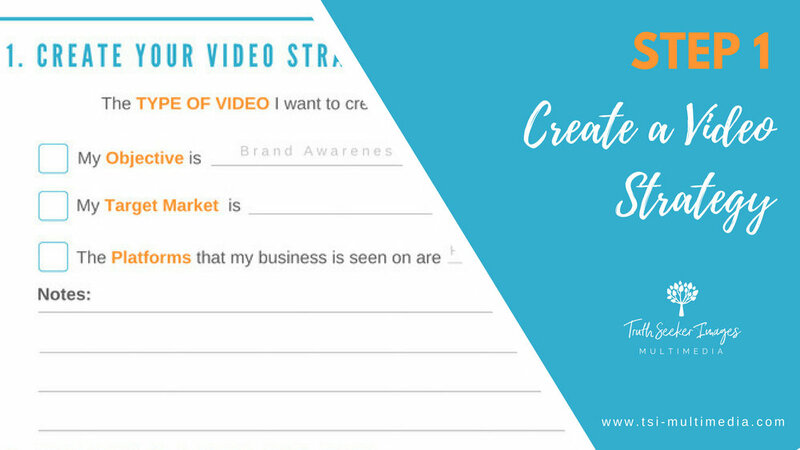 Last week we looked at the first step to easy video creation, to stop the overwhelm when creating videos for your business, which is to CREATE A VIDEO STRATEGY. This week we go into STEP 2: START WITH 3 SIMPLE TOOLS. It really is that simple, but we as humans tend to overthink and complicate things, coming up with excuses to why we can't get started. But if we're honest with ourselves, we know that all we need to do is have plan, and then get out of our own way and get started. If you're a micro or small business owner, then making videos can seem like an expensive exercise. But it doesn't have to be. So today I'm going to share with you three affordable and easy-to-use tools for you to start making professional looking videos RIGHT NOW! Now remember that these tools are just a starting place and is a general recommendation. If you've read last week's post on creating a video strategy, and going through the exercise of working that out, then you may find that depending on what kind of video you want to create and your strategy, that your specific needs require to buy alternate equipment. If you're not sure, then feel free to ask by leaving a comment or emailing me at info@truth-seeker-images.com. Here are the 3 SIMPLE TOOLS and what they'll cost you. If you're in business, then you will already have a smartphone (hence the cost is $0). The more recent your phone, the better quality and video you'll be able to take. In fact, you don't need all three tools to even start taking video. You only really need your phone. Have you taken photos or videos on your phone of your children, pets or while on holiday or just out? If you are, don't discount these skills. Take that same approach and those skills you have, across to your business. Have some fun when you're starting out. Play with it. Have a laugh at yourself. If it doesn't work the first time, then delete it and try again. It's not a waste of time, because you're getting better each time. 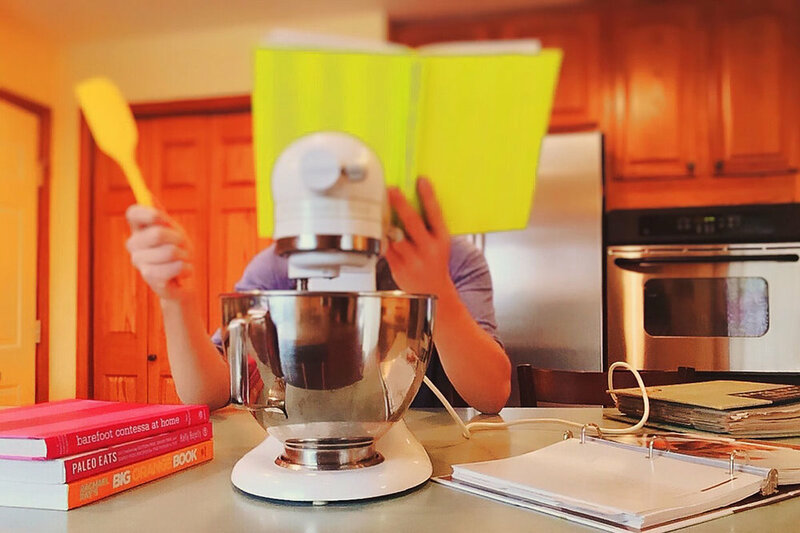 HINT 1: To steady your phone to reduce shaky video, hold with two hands or place both elbows on a surface while holding your phone to video, or lean against something solid to support your body. HINT 2: Use the 'Self-timer' on your phone. This way you have time to get into position before the video begins. HINT 3: For the most flattering angle, hold your phone at eye level or above and look towards the camera on your phone. Using a phone tripod is the best way to stop the shake in your videos. By placing your phone on a tripod, it stabilises your phone and allows you to use both hands, and place your phone at any distance you want to. They are also small, light and portable, allowing you to easily take them anywhere and set-up. Phone tripods are the most affordable option to start, and is best set-up on a flat, even surface like your desktop or bench. Just make sure that your phone is at eye level or above to where you are sitting or standing. If you like standing then you may want to invest in a standard camera tripod so it will be at the right height. Just make sure you have a phone bracket that you can put on the tripod, as only phone tripods come with phone brackets. a. Sturdy legs and base. b. Central column to extend the height. c. You can adjust the phone to tilt forward or back and sideways. d. (optional) Blue Tooth remote will allow you to stop and start your video from a distance. Also, I would recommend getting a phone tripod with a phone bracket that you can detach. This way, if and when you want to use a standard camera tripod, you don't have to buy another phone bracket for it. You can buy phone tripods from department stores, stores that sell camera gear (like Harvey Norman) or dedicated camera stores. Lapel microphones are the easiest and cheapest type of quality microphones you can buy when starting. I highly recommend the RODE Smartlav lapel microphone (pictured). It's captures great quality sound. Lapel microphones, because they are close to your mouth will pick up your voice clearly over any ambient sounds in the background or surroundings. They plug straight into your headphone jack on your phone. If you like to stand at a bit of a distance from your phone, you can also buy extension cables for your microphone, so you can stand a bit further away and still get clear, crisp sound. *N.B. If you have an iPhone 7 or more recent, you will need your adapter, as the latest iPhones don't have a normal audio jack, but have a USB jack. So that's all the equipment you need to get started. It is simple. Much simpler that using a DSLR camera. These tools require little technical knowledge to be able to use them, which makes them ideal for those of us who aren't technically savvy. It's the perfect combination tool kit...easy to use, quick to set up, portable and best of all, you can create great looking video for your business! So what's stopping you? Go out there and just start playing and practicing. Next Week we cover Step 3: How to Write A Video Script to Engage Your Audience. Click here to go back to Step 1: How to Stop the Overwhelm with a Video Strategy. And remember, if you have any questions about using the equipment, or what to buy or what's going to suit you, then shoot me an email at info@truth-seeker-images.com, and I'll be able to set you off on the right foot. Are you wanting to create and use videos to grow your business to attract more clients, but still haven't started yet? Maybe you're feeling a little overwhelmed with all the moving parts that it takes to create a video, and you just don't know where to even start. If you want to use video to grow your business, then JUST START, however imperfect that looks right now. Starting is made easier when you have some guidance and a PLAN. So this week, I will begin to guide you with Step 1 of the '4 STEPS TO EASY VIDEO CREATION'. It's up to you to create the plan and then work it. The first step to stopping the overwhelm is to 'CREATE A VIDEO STRATEGY. Understand that using video is only one part of your marketing PLAN. The plan doesn't have to be so enormous that you once again go into overwhelm. Just look ahead far enough to take the next step and make a plan based on that. Whether your plan is a weekly, monthly or quarterly plan isn't important. The main thing is that it's realistic and achievable for you. 2. Know who your TARGET MARKET is. 3. What PLATFORM will your video be seen on? * Launch, promote and sell products and services through promotional and branding videos. * Tell people who they are and what their business is about using an Introductory or Welcome video. * Create videos to support their Online courses and programs. * Launch an event, i.e. workshop, trade show, seminar, retreat. * Build trust and credibility with a Customer Testimonial. * Educate their customers, i.e. 'How To', Tips & Tricks, Instructions for Use, etc. * Train Staff or Customers with videos that explain repeatable processes in their business. * Tell a Story about themselves, their business or their customers with a feature video. * Engage and educate their audience to build a database, following, or community with valuable content using live and pre-recorded videos, i.e. FB live, Linkedin native video. So the question is...WHAT DO YOU WANT TO START WITH? Pick one thing and focus on that. If you don't know yet who your target market or ideal client is, then start working on that. Here are some questions to ask? * What is my product and/or service and what makes it unique if I was to compare my business model with others in the same industry? * Who do I want to sell my products and services to? General public/individuals, small or big businesses, government organisations. * What are their demographics? Age, gender, marital status, income, spending habits, location, etc. * What are their interests and hobbies? Environment, coffee, shopping, fishing, fitness, social issues, pets, personal development,etc. * What do they value? Family, success, connection, culture, travel, health, creativity, freedom, etc. After answering these questions, you should have a pretty good idea about who your target market is. Now when you create the content for your videos, you know who you're talking to specifically and how to say it in a way that speaks to them and connects with them. You may not get it perfect when starting. But keep tweaking and refining your message. You'll know when you've hit on something when you get more and better engagement, leads and interest, which eventually turn into sales. 3. WHAT PLATFORM WILL YOUR VIDEOS BE SEEN ON. Where is the source of your leads mainly generated from? Where do your customers hang out and engage with you? How do your customers find you? Something to note is that if you generate leads through face-to-face interaction or networking, inevitably you'll be directing them back to an online platform for more information. The reason you need to take the platform into account, is because it helps determine what your video looks like in regard to type, style, look and feel, type of content and length of time. There are other factors, but we will talk about that later. So this week, sit down and make a start on your VIDEO STRATEGY and start working through these three things: Your Objective, Target Market and Platform. Remember to FOCUS ON ONE THING...ONE OBJECTIVE! Write it down, because you're going to need to know what that is, as we go through the three remaining steps of '4 EASY STEPS TO VIDEO CREATION'. Next week, I will take you through STEP 2: 3 SIMPLE TOOLS TO MAKE YOUR VIDEO. If you have any questions that arise through going through the above steps, you can email me at info@truth-seeker-images and I'll be happy to help you. --WOULD YOU LIKE MORE HELP AND GUIDANCE IN CREATING VIDEOS? I NOW OFFER ONE-ON-ONE VIDEO COACHING, BOTH ONLINE AND IN-PERSON. YOU CAN FIND OUT MORE ABOUT MY VIDEO COACHING SERVICES HERE. Just a reminder...Mother's Day is coming up this Sunday. It's an opportunity for us if we can and if we have or had a positive relationship with our mothers, to spend time with them or thinking of them. To remember what they do for us...what they've done for us and how they may have shaped the person we've become. What do you remember about your mother? What are those special things that she did for you as a child growing up? Those special things that you still remember as an adult that make you smile. You know those things. Those things where nobody else can compare. For example, my mother is an awesome cook! Nobody makes fried rice like my mother. I've tasted many dishes of fried rice, but nobody cooks it as good. She also makes the best scones in the world, that melt in your mouth. She is the youngest of twelve children and after her mother died when mum was only a child, she was raised mainly by her oldest sister who was a chef and specialised in chinese cuisine. Mum's sister passed on her culinary skills to my mother. At every family gathering ever since I was a child, I remember mum's signature dishes; special fried rice, Chau Kai (deep fried chicken with special herbs and spices), steamed pork dumplings, chinese wonton, and many more. One of my favourites we called 'Power Soup' (I don't know the chinese name for it) which nobody else would eat except for myself and my mother. It had pork ribs, tofu, chinese vegetables, Pig Ear Fungus (Wood Ear Mushrooms) and a splash of brandy. Maybe that's how it got it's name. This is what my mother is renowned for. Nobody else (in my mind) can cook like her. Nobody compares. When your customers think of you and your business offerings, what is it that makes you memorable? What do you give that your customers remember you for and keep returning because nobody else can give them that special something? And when you think about or spend time with your Mother this Sunday, think of all those special things that only she can do that make her dear to you and I hope you feel gratitude.